तुम भी मेरे अपने हो, या सिर्फ हम ही तुम्हारे हैं ?? मगर हमारी बेचैनियों की वजह बस तुम हो ! तू रुक जाये तो मैं नही, मैं ‪‎मर‬ जाऊँ तो तू नही ! So these were popular Whatsapp Hindi sad lines, i hope you shared this page with your friends. If you haven't shared yet then please share and help us to spread this page. 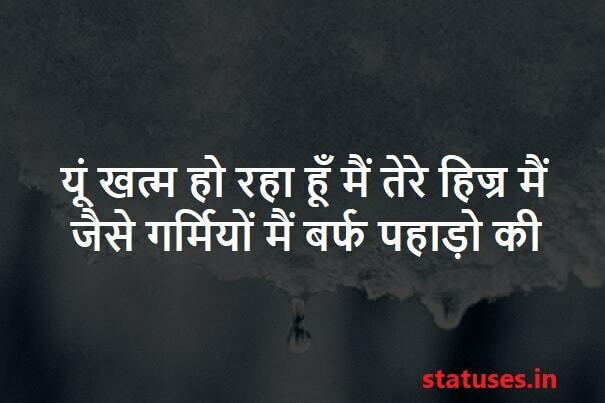 Read our other collection @ best hindi statuses and comment down to share your status collections.